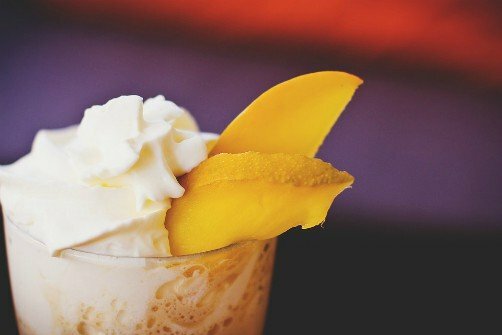 Espuma de Mango. Mango mousse. Bolivian Food and Recipes. Bolivian Desserts. What's special about mango mousse is that it isn't filling or overly sweet like some other mousses. Mango is surprisingly refreshing and this dessert is really nice after seafood. * You can substitute with rum extract or essence. ** I like to use clear (transparent) vanilla when possible so as to not darken the mousse. I also sometimes substitute with vanilla paste instead of liquid extract (in which case the mousse will darken). The vanilla we use here in Bolivia is primarily organic. In a blender, blend the condensed milk and add the egg yolks one by one, then add the lemon juice and mango pulp. Blend well. On low heat, cook the unflavored gelatin with a little water, stirring until it is completely dissolved and add to the blended mixture. Blend again. Beat the egg whites with the vanilla and rum until stiff and gently fold them into the blended mixture until completely incorporated. Put the mixture into a lightly greased mold and refrigerate three hours prior to serving. Serve in a dessert bowl or plate ringed or topped by mango slices.